Before the "Battle for Michigan" began, ESPN color commentator Dan Dakich pointed out that the University of Michigan was leading the Big 10 in points in the paint, with 36.4 per game. Although the Wolverines don't possess prolific low post scorers, they are proficient at getting into the lane thanks to Tim Hardaway Jr. and Trey Burke. In fact, Burke is especially adept at drawing defenders in and dishing the ball out to his teammates for easy shots. 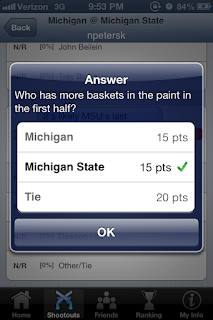 However, what Dakich didn't mention was that Michigan State entered tonight's contest averaging only 0.2 fewer points in the paint than the Wolverines. Additionally, the Spartans have Derrick Nix, a 6-foot-9, 270 pound low post presence who was bound to cause Michigan problems in the paint. With Nix and Branden Dawson on the block, the Spartans made 12 first half field goals from inside the key. Meanwhile, Burke and Hardaway had difficulty penetrating the perimeter defense established by Michigan State's aggressive guards, particularly Keith Appling. The result? Michigan recorded just four points in the paint in the first half. We posed a situational SnapCall question in the early in the game to test just how well you could predict the outcome of the match-up down low. If you answered correctly, well done. 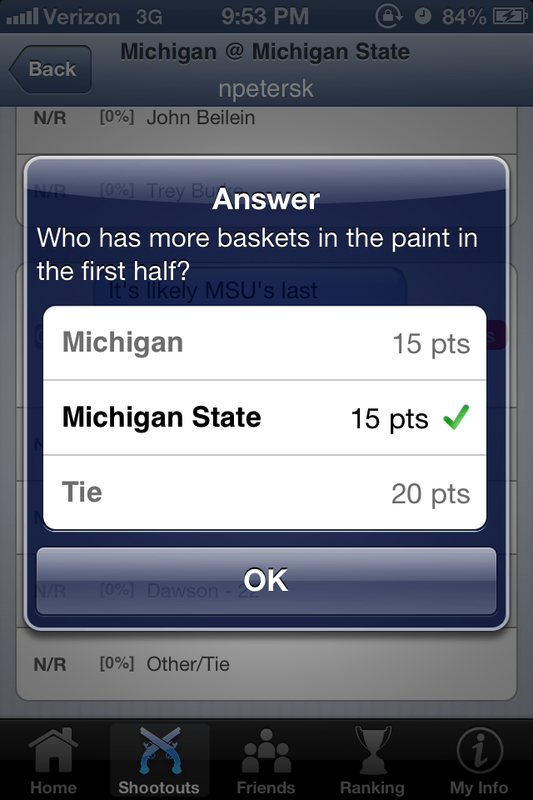 Both you and Tom Izzo clearly identified Michigan's glaring weakness. To join the predictive fun on your iPhone, download SnapCall Sports (free app) from the App Store and tune your TV to the games we're covering! It's that easy.